WASHINGTON (CNN) -- The Watergate Hotel, part of a complex that became synonymous with President Richard Nixon's downfall, attracted no bids at an auction Tuesday. 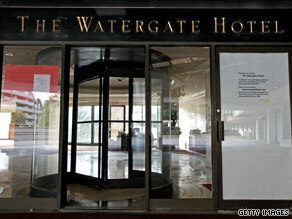 The Watergate Hotel will most likely have to be sold privately after not attracting bids at auction. According to Paul Cooper, vice president of Alex Cooper Auctioneers, some 10 bidders ready to provide a $1 million deposit were registered for the auction. But the hotel fell back into the hands of its lender, PB Capital, after no one advanced the $25 million opening bid, the auction company said. The auction was sponsored by PB Capital, which holds a $40 million note on the hotel after the previous owner, Monument Reality, defaulted on its loan. Monument's 30-day foreclosure note expired Thursday. Cooper said PB Capital will most likely sell the hotel privately after it takes over the title and will not try to operate the hotel itself. On the night of June 17, 1972, the hotel served as a base for an illegal break-in by operatives of the Nixon re-election campaign at the offices of the Democratic National Committee, located in the Watergate office building next door. Some of the burglars and their handlers, whose arrests began the investigation that led, two years later, to Nixon's resignation, actually stayed at the Watergate hotel prior to the break-in. Among the hotel guests were former FBI agent G. Gordon Liddy, and former CIA operative Howard Hunt, both of whom later served prison time as a result of the Watergate break-in. Developers estimate the hotel could need up to $100 million in renovations. The Watergate complex was built in the late 1960s and consists of the hotel, two office buildings, and three apartment buildings. Only the hotel building was up for auction Tuesday. It closed two years ago for renovations, and possible conversions into co-op apartments.